New Years Watch Night traditional service rings in the New Year for many churches in the United States. Many will greet the new year by toasting with glasses of champagne, perhaps singing a few remembered lines of "Auld Lang Syne" or tuning in to watch the throng of merrymakers on New York City's Times Square. A more sedate and, many say, more powerful observance will unfold simultaneously in the houses of prayer. 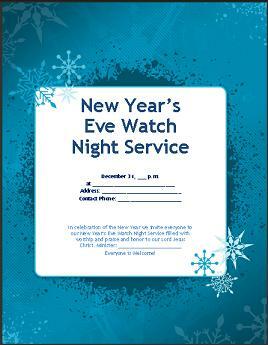 If your church participates in the Watch Night service prior to the new year, just download and print the New Years Flyer below and post for your church members as a reminder of the new years activities coming up soon in your church. If your Sunday School children or children at home would like to play a great game to keep them occupied, then feel free to download and print the the Jesus Bingo game for lots of fun during the New Years or any other holiday. The Watch Night service is on the last day of the year and is a night when everybody in the church usually takes a part in the church service, usually by praying in the new year by being on their knees as the clock strikes 12 midnight, or takes part in other ways depending on your church's traditional service. Some churches takes time in the Watch Night service to have testimonials on what they are thankful for throughout the year, and thanking God for keeping them through the year. Whether or not someone stood to testify, Watch Night is a spiritual service hinged between the past and the future. Return to the New Years Activities from the New Years Eve Flyer/Games.